That voice. It had haunted him since summer. Jesse Brewster pushed himself up to a sitting position on the lounge couch and muted the sound of the race video he was studying on the ninety-inch TV. It couldn’t be. He shook his head to block the sound, dispel the memories and ran his hand through his disheveled hair. Lauren was at Syracuse University taking finals. “See you,” Royce Evans, one of the other Team Macachek racers said distinctly. Or Syracuse was the place Lauren was supposed to be. Her and Royce? Jesse worked a muscle in his jaw. Was that the real reason she’d stopped coming to his races, sent him the break-up text? Jesse unmuted the TV and jacked up the sound to drown out his thoughts and anything else he might hear from the hall. He placed his elbows on his knees and focused on the action. To perfect his technique, he studied videos of his motocross races, wins and losses, to see what he had done right and wrong and what his competitors had done right. It was his job and ambition to be the best. Jesse frowned at his less-than-stellar execution of a jump. By his account, he had to rack up enough winnings in the next ten years or so to invest for the rest of his life. Given his lack of success with the online engineer degree at Arizona State University his parents and Lauren had pressured him into, what else could he do that was anywhere near as lucrative as racing? Limit pressuring him to his parents. Period. Where Lauren was concerned, it had been his need to impress her by proving he could do more than race, be more for her. Jesse swung his head around and froze at the virtual sucker punch that slugged him in the gut. It hadn’t been his imagination. Lauren Cooper stood in the doorway in all her blond glory. His imagination never gave justice to the real thing. “Jesse?” Her voice was barely above a whisper but loud enough to send a shiver through him. He didn’t ask what she was doing here in the barracks, as the guys on the team called the resort-like facility Mac Macachek, the owner of the racing team, had built at the team’s headquarters in Chenango Falls—Mac’s hometown in Central New York. After hearing her with Royce in the hall, Jesse didn’t want to know. “I uh, had early finals.” Lauren stared at her feet. What was that about? Unless she regretted what she’d done to him. His heart raced Yeah, right. He was one sick puppy when it came to Lauren Cooper. He should have seen the writing on the wall when he’d told her last June that he’d only signed up for one class at the University of Arizona Online for the fall semester. He’d barely made Cs in everything but his one engineering class in the spring semester. After that, she’d started coming up with excuses for not coming to his races, even when he’d offered to pay for her travel and, then boom, The Text. “You’re here for the team Christmas party?” she asked. Lauren laughed, but the sound lacked the bouncy spontaneity he was used to. “Yes, I know how Sari is.” Lauren scuffed her foot on the floor, and Jesse dropped his gaze from her face. She gripped the handle of a vacuum in one hand, the pail of cleaning supplies in the other. “I’ll come back later when you’re finished in here,” she said. “Something like that.” She wouldn’t meet his gaze. “You can do your thing. I’m just watching the video from High Point, the competition Sari drove down to Pennsylvania for with just Mac and Dana.” Yeah, he was getting in a dig. That was the first race Lauren had cancelled out on. Lauren pulled her hand from his, sending a chill up his arm. “It wasn’t working. The distance. Us, our lives, we’re too different. We, I…” She stumbled over her words. He wanted to shout BS. Aside from his racing, Lauren was the only thing that had worked in his life for a long while. The guys? Royce? Royce was on the road a lot, too, except he’d stayed here in the northeast for arenacross for the winter, while Jesse had gone back to his native California outdoor tracks to race. He folded his arms across his chest. “If you mean the pit tootsies, they don’t mean anything. And, I’m sure what you’ve heard is an exaggeration.” Especially, if Royce, or whoever was Lauren’s source of information, thought he had a chance with her. “No, it’s not that.” Her voice and expression were devoid of any emotion. So, she and Royce weren’t a thing? Lauren grabbed the vacuum. “I’ve got to get to my other work.” Her blond braid swinging with her forceful steps, she made her getaway without even a goodbye. Jesse stared at the closed door. That wasn’t all. Not by a long shot. In the couple of weeks left before his flight back to California, he’d find the real reason for Lauren’s behavior. He refused to believe she didn’t love him anymore. Lauren leaned against the door, feeling Jesse’s gaze drilling into her from the other side. His pull. Her feelings. They were still there. She couldn’t, wouldn’t let him distract her again. Having him as a part of her life was like wearing blinders. She only saw the shadows of anything else going on. And look where that had gotten her and her mother. She’d had no inkling her father… Lauren shook her thoughts from her head. Lauren opened her eyes at Dana Macachek’s question. “’Ren, ’kay?” Dana and Mac’s two-year-old, Rudy, toddled over and patted Lauren’s leg. “Sorry, pal. I have to finish my work,” Lauren answered, thankful that the conversation had moved away from Jesse. Lauren laughed. Rudy was adorable. When he was born, Jesse had still been living with Dana and Mac at the house. The barracks hadn’t been built. She’d shared her surprise at Jesse’s ease with the newborn. He’d grinned the smile she’d thought of as her smile and said, “What can I say. I’m a kid magnet.” They’d talked about kids and, since they were both only children, agreed three sounded right. It seemed like a lifetime ago. She swallowed the lump in her throat. “That’s not my job.” Lauren pushed the vacuum forward. “Daddy. Bikes.” He shot down the hall with Dana fast on his heels. Lauren wished she could talk with Dana. But her problems were her own to solve. The past six months since her father had left, dealing with her mother’s helplessness, had taught Lauren that she needed to be strong and self-sufficient. She placed the cleaning bucket on the floor outside the lounge and attacked sweeping the hall carpet with a vengeance. Dana and Mac’s situation had been similar, but different. They’d been married at Lauren and Jesse’s age, although soon after, they’d been torn apart by Dana’s father and the distrust he created. Mac and Dana hadn’t gotten together again for seven years. Other problems aside, Dana had never been in the financial bind concerning college that Lauren was in. She couldn’t take another semester off her studies at Syracuse or she could lose her full tuition scholarship. Her elbow cracked with the force of her effort. She had to get the grant she’d applied for. Her father had decided to renege on his promise to pay for that part of her education, and her mother was in too much denial over her situation to pursue any separation or support agreement. Even working full-time, what she’d put away from taking the fall semester off and working didn’t come close to covering all of her room and board. Not after the financial help she’d had to give her mother. Lauren pushed her hair behind her ear. Jesse had tried to be there for her—too much. She wasn’t about to become dependent on a man like her mother had. 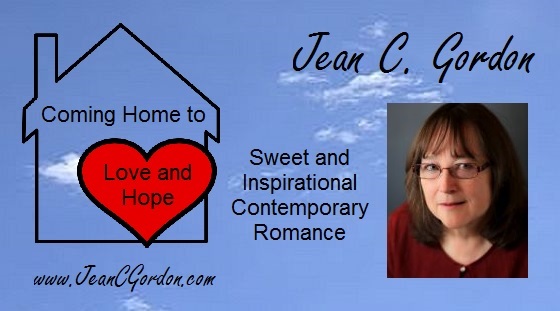 When Lauren hit the far end of the hall, she sensed as much as heard the door to the lounge open and shut, and crossed her fingers that Jesse’s room or wherever he was headed was in the opposite direction. Breath held, she turned and caught Jesse disappearing through the doorway to the second floor and hurried back to the lounge. She glanced at the computer printout tucked in the cleaning bucket. Jesse must have gotten in really late yesterday or early this morning. No second-floor rooms were on her cleaning list for today. Her stomach dropped. But his room, filled with his things, his presence, would be on her list tomorrow. She pushed opened the lounge door. Jesse’s cologne, his distinct sea and wind scent clogged her throat with a longing she’d thought she’d finally locked away. She ground her teeth. She didn’t need Jesse Brewster. She didn’t need anyone but herself. Wonderful first chapter, Jean. Can't wait to read more! 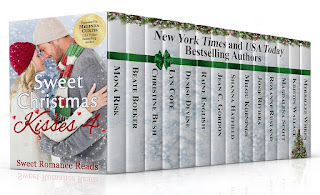 SNEAK PREVIEW from Sweet Christmas Kisses 4!